The one of the most common questions that WordPress beginners ask is how they can rename the Uncategorized category in WordPress. Well, We all know that WordPress comes with default Post, Page, comment and category. And if you are wanting to remove or rename them, then you can. 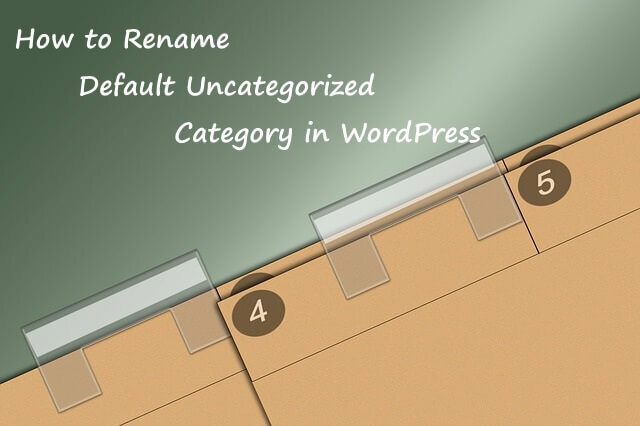 So in this WordPress beginner tutorial we will show you how you can rename the Uncategorized Category in WordPress. Categories are the pre-defined taxonomies in WordPress. which comes with WordPress installation. To rename the Uncategorized Category the first that you need to do is go to your WordPress admin panel and click on the Posts tab then categories and there you will see your all Categories. Then click on edit link on your Uncategorized category. On the next page you can rename your category, Just simply add your category name that you want to change and also add a slug for your category which URL of your category. In WordPress you can't delete the default Uncategorized categories, but you can rename them. So this is how you can rename the default Uncategorized categories. Do you know? 300,000,000 hacking attempts in a day! Due to National Security Agency’s (NSA) data center. If you are beginner at WordPress security. then you should learn about WordPress security and we have also written the guide for you. read How to secure WordPress site. If want to increase your website visitors then you should read our best guide on it. How to Encourage People to Stay and Read Your Posts and also learn about readability. which is very important for SEO. 5 Incredible Tips To Write Readable Blog Posts. We hope you may learn from this tutorial if you do then make sure to like and follow us on Twitter, Facebook to get latest updates from us. The best preparation for tomorrow is doing your best today. - H. Jackson Brown, Jr.